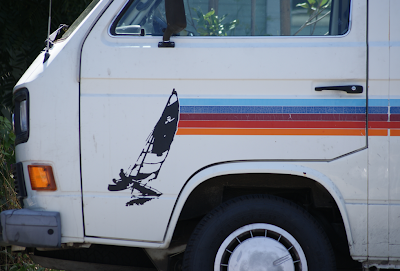 Sometimes, the ho-hum reaction to the Vanagon, AKA the T3, is a little off-putting. They are welcome to Bay Window campouts around here, it seems, because the people are like-minded, and, frankly, there would be about 3 buses there if someone ever tried to organize a Bay Window-only campout. Note here, that according to my own quick social labeling, Big Blue falls 4th from the bottom. 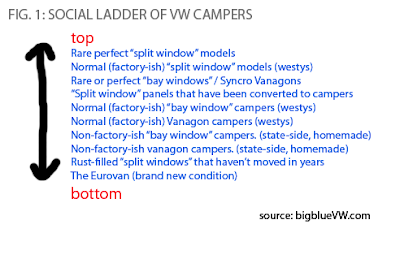 But I think that those who put the Vanagon at the bottom of the list are missing the quiet charm of the vehicle. There is something about the early model before VW changed the grill (in 1986, I believe). And the color combinations that they offered represents the optimism of the 1980s. 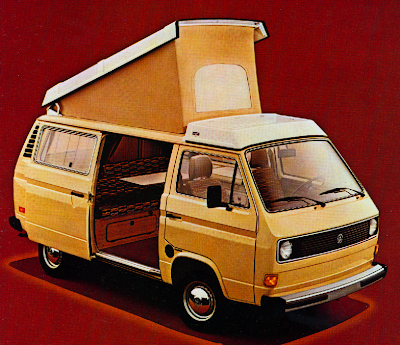 If the Bay Window was at home living in bright reds, yellows and lime greens in the 1970s, then the Vangon found itself with OP-like graphics, faux-wood sides, creamy yellows, and the deep brown of luxury. And let's face it, The modern comforts of the Vanagon camper - even prior to going water-cooled mid-year in 1983, are obvious. They go faster down the road, have more space, are quieter, have speakers installed from factory, and, I would assume, street-camp with more stealth than a bay window. 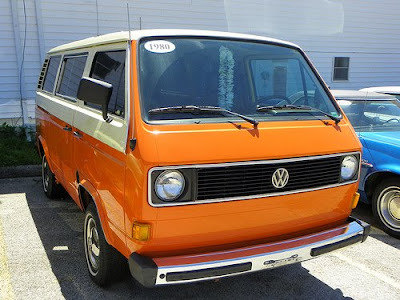 When camping friends, uninterested in the "bus lifestyle" ask what I think about them getting a bus to camp in, I almost always tell them if they aren't worried about style, to go with a vanagon. But I think I am selling it short. Just because the Vanagon doesn't seem quite as raw an experience as the Bay Window, and certainly not as much as the Splitty, the Vanagon does have a style. 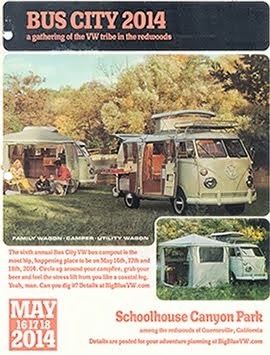 Perhaps, in due time, the Vanagon will be show it's true colors and come into the mainstream as a classic a little more. And maybe it will get the respect it deserve (and not be lumped into the the chat room on TheSamba with the lowly Eurovan!) I think they are full of charm and personality. Not to mention, it's fun to say. Van-a-gon. Say it! 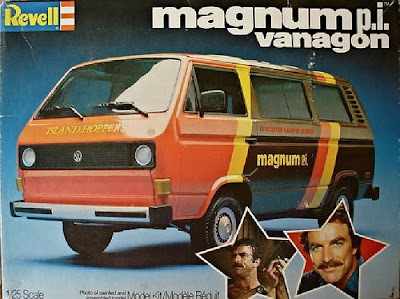 I think that Magnum P.I. version might just push Peter over the edge of becoming a VW enthusiast! And I love the Op-like graphics. I can hear the velcro ripping open on one of those wallets now. Or even the sound of corduroy rubbing on those shorts that were just a little too short. Good stuff. It is funny how much more positive attention our Vanagon gets from passerbys now that the 80s are "back". Just like the 80's--she's as ugly as sin, but we love her anyway. Frog - A Vanagon would be the perfect ride for you guys. Except they don't make a convertible. Minnie - Interesting to hear that the Vanagon is gaining some street cred. All it lacks is to start being used as background filler in fashion catalogs - then it will have managed to squirm back into pop culture. I, for one, hope that it does. 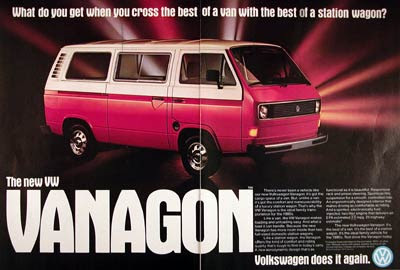 Vanagons are super cool, and totally underrated. I like the pinstripes on the first one too. I have to tell you though, that not all bay window buses are super slow. Ludwig can cruise at highway and interstate speeds without a problem. For real. Like we regularly pass people and everything when we go on road trips. I swear. I'm not making it up. And we have some friends with an air-cooled Vanagon that is much much slower than Ludwig (we post about them sometimes, we've camped with them a couple of times this year). I think they have the same engine, but that Ludwig is much lighter. (I'm sure Mitch will remember the spec's.) Anyway, I just wanted to chime in a say I like your editorial and agree with you that Vanagons rock (and for some reason we pronounce it van-a-gone in our house, I don't know why). I think a biodiesel Vanagon would be pretty fun to have. Melissa - You are right. I almost made the comment that the Vanagon has swivel captain chairs, then I remembered the late Bays do as well. I tend to look at thinks through 1968-colored glasses. 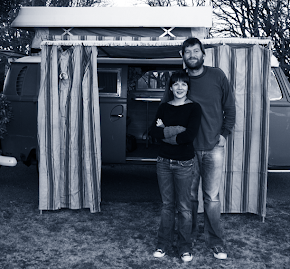 We know an old, hippie couple that has a diesel Vanagon camper. I'm thinking the biodiesel would be a fantastic option.